For other Pennsylvania townships of the same name, see Ross Township, Pennsylvania. Ross Township is a township in Monroe County, Pennsylvania, United States. The population was 5,435 at the 2000 census. 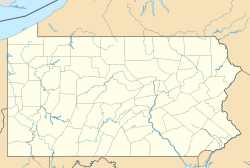 Ross Township is one of 16 townships in Monroe County, Pennsylvania. Ross Common Manor was listed on the National Register of Historic Places in 1978. On August 5, 2013, three people were killed, and at least three were in critical condition in a shooting at a township supervisors' monthly meeting after 7:30 p.m. EDT at the Ross Township building. The gunman, 59-year-old Rockne Newell, was tackled by West End Open Space Commission executive director, Bernie Kozen, and Newell was shot with his own gun. He was taken to the hospital and released into police custody. Newell approached the building armed with a long gun and opened fire through the windows. Up to eighteen people were inside at the time. Newell had an ongoing dispute with the Ross Township board of supervisors and they repeatedly told him to clean his land. According to the United States Census Bureau, the township has a total area of 22.7 square miles (58.7 km2), of which, 22.6 square miles (58.6 km2) of it is land and 0.04 square miles (0.1 km2) of it (0.18%) is water. It is drained by the Aquashicola Creek westward into the Lehigh River. Blue Mountain forms its natural southern boundary. Its villages include Ross Common, Rossland, and Saylorsburg (also in Hamilton Township). As of the census of 2000, there were 5,435 people, 1,875 households, and 1,518 families residing in the township. The population density was 240.3 people per square mile (92.8/km2). There were 1,974 housing units at an average density of 87.3/sq mi (33.7/km2). The racial makeup of the township was 96.61% White, 1.09% African American, 0.07% Native American, 0.39% Asian, 0.77% from other races, and 1.07% from two or more races. Hispanic or Latino of any race were 2.19% of the population. There were 1,875 households, out of which 40.1% had children under the age of 18 living with them, 69.9% were married couples living together, 6.9% had a female householder with no husband present, and 19.0% were non-families. 13.0% of all households were made up of individuals, and 3.9% had someone living alone who was 65 years of age or older. The average household size was 2.87 and the average family size was 3.16. In the township the population was spread out, with 28.6% under the age of 18, 5.7% from 18 to 24, 31.0% from 25 to 44, 25.0% from 45 to 64, and 9.7% who were 65 years of age or older. The median age was 38 years. For every 100 females, there were 102.7 males. For every 100 females age 18 and over, there were 100.8 males. The median income for a household in the township was $48,750, and the median income for a family was $52,639. Males had a median income of $40,716 versus $28,750 for females. The per capita income for the township was $20,002. About 5.0% of families and 7.2% of the population were below the poverty line, including 7.8% of those under age 18 and 5.8% of those age 65 or over. Residents of Ross Township may attend the local, public schools operated by Pleasant Valley School District which provides half day kindergarten through 12th grade. In 2013, the Pleasant Valley School District's enrollment declined to 5,435 students in kindergarten through 12th grade. In 2010, Pleasant Valley School District enrollment was 5,885 pupils. Pleasant Valley School District operates Pleasant Valley High School (9th-12th), Pleasant Valley Middle School (7th-8th), Pleasant Valley Intermediate School (4th-6th), and Pleasant Valley Elementary School (K-3rd). In 2013, Pleasant Valley School District’s graduation rate was 85.7%. In 2013, the Pittsburgh Business Times ranked Pleasant Valley School District 285th out of 496 public school district's operating in Pennsylvania, for academic achievement of its pupils. In 2012, Pleasant Valley School District declined to ‘’Warning’’ Adequate Yearly Progress (AYP) due to lagging student achievement in both reading and mathematics at the high school, the middle school and the elementary school. High school aged students can attend the taxpayer funded Monroe Career & Tech Institute for training in the building trades and other areas. The School is located at 194 Laurel Lake Road, Bartonsville. Monroe Career & Tech Institute is funded by a consortium of the local public school districts, which includes: Pleasant Valley School District, Stroudsburg Area School District, East Stroudsburg Area School District and Pocono Mountain School District. Ross Township residents may also apply to attend any of the Commonwealth's 14 public, cyber charter schools (in 2013) at no additional cost to the parents. The resident’s public school district is required to pay the charter school and cyber charter school tuition for residents who attend these public schools. By Commonwealth law, if the District provides transportation for its own students, then the District must provide transportation to any school that lies within 10 miles of its borders. Residents may also seek admission for their school aged child to any other public school district. When accepted for admission, the student's parents are responsible for paying an annual tuition fee set by the Pennsylvania Department of Education. Colonial Intermediate Unit #20 provides a wide variety of services to children living in its region which includes Ross Township. Early screening, special education services, speech and hearing therapy, autistic support, preschool classes and many other services like driver education are available. Services for children during the preschool years are provided without cost to their families when the child is determined to meet eligibility requirements. Intermediate units receive taxpayer funding: through subsidies paid by member school districts; through direct charges to users for some services; through the successful application for state and federal competitive grants and through private grants. East Stroudsburg University of Pennsylvania is a public university located in neighboring East Stroudsburg. It is one of the 14 state universities that make up the Pennsylvania State System of Higher Education (PASSHE). Eleventh and twelfth grade students may attend the University at a significant tuition discount through its Dual Enrollment program earning college credits while still earning their high school diploma. Additionally, Pennsylvania residents who are at least 60 years of age and retired may enroll as non-matriculating students tuition free. Residents may also attend Northampton Community College which operates campuses in: Bartonsville and in Pocono Township, Monroe County. Pleasant Valley School District is not a sponsoring school district of the College. Ross Township residents therefore do not receive a tuition discount. Community members have access to the Eastern Monroe County Public Library which is located on 1002 North 9th Street in Stroudsburg. Through it Pennsylvania residents have access to all POWER Library online resources. Ross Township residents may also use the Western Pocono Community Library situated in Brodheadsville. Map of Monroe County, Pennsylvania with Municipal Labels showing Boroughs (red), Townships (white), and Census-designated places (blue). Ross Township is governed by three locally elected Township Supervisors. In Pennsylvania, the term of office of a Supervisor is 6 years. The Ross Township Supervisors Monthly Meetings are typically held at the Ross Township Municipal Building, 258 Anchorage Road, Saylorsburg. In 2014 the Supervisors are: Howard A. Beers, Jr., Chairman; Tina Drake, Vice Chairman and Russell A. Kresge, Jr. Supervisor. ^ "Gunman Tackled After Killing 3 at Town Meeting". nbcphiladelphia.com. Retrieved 6 August 2013. ^ "3 confirmed dead in Ross Twp. municipal building shooting". The Pocono Record. Retrieved 6 August 2013. ^ Pennsylvania Department of Education (October 4, 2013). "Pleasant Valley High School - School Performance Profile 2013". ^ Northampton Community College administration (2014). "Northampton County Residency Policies". Archived from the original on 2014-07-13.